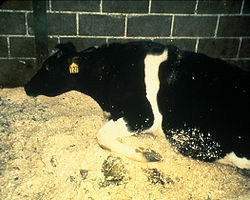 ↑ "A Focus on Bovine Spongiform Encephalopathy". Pathogens and Contaminants. Food Safety Research Information Office. November 2007. Archived from the original on 3 March 2008. สืบค้นเมื่อ 2008-04-07. ↑ Brown, David (19 June 2001). "The 'recipe for disaster' that killed 80 and left a £5bn bill". The Daily Telegraph. London. สืบค้นเมื่อ 2008-04-07. หน้านี้แก้ไขล่าสุดเมื่อวันที่ 1 ธันวาคม 2558 เวลา 21:31 น.